During the rule of Rome’s most depraved Emperor we meet Tullus, a distraught war veteran who is rewarded for saving the life of an influential politician. Now assigned to an elite position in the capitol, he finds true love with a beautiful noblewoman. But just when he thinks his life is perfect things fall apart, and Tullus is forced to rethink his future. By chance he encounters a benevolent circus ringleader with a dangerous past, befriends a mythical creature with unique abilities, and learns more about his hidden secret. But murder, sexual intrigue, and dangerous conspiracies threaten to encircle him, and tear his new world apart. I picked this book out while scrolling through my Twitter feed- I get tonnes of book recommendations but this was the first one that really jumped out at me, so to the Kindle store I went! The first thing I noticed about this book was that Uner is clearly a history buff and has spent a lot of time researching Roman history to make the story as authentic as possible- the descriptive language was gorgeous and you could feel his passion for this era in the words. Though I can’t say that I have more than a high school education in history and the Roman era, I get the feeling that this book was about as authentic as it’s possible to be. There wasn’t as much character development as I would have liked in this book, but I feel that this is because the author already knew he was going to be writing a series and planned on elaborating more laeter. I was disappointed not to know more about the leopard, given that she made it into the title of the book, but we did get one gratuitous chapter from her perspective. 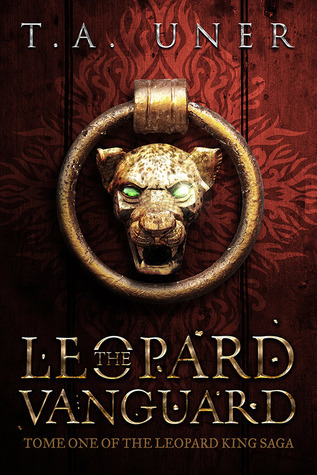 The storyline was strong and full of promise, Roman politics crossed with some magic and badass junglecats. I don’t want to give away much here, in case you’re planning on reading this- but it’s a good’n. This book is the first published title by this author (I believe) and it does have the usual quirks that you usually notice in first titles while the author is developing their own personal style. The dialogue between characters, especially towards the beginning of the book, is cliched and possibly not genre appropriate but it does flow a lot better by the end. I did have to giggle a bit at the bad guy saying something super villain-esque and rubbing his hands together. All in all, I really loved the writing style and the premise of the story and am confident that the niggles that I had about the dialogue will improve throughout the series. You can also see that it was a compelling read given that I was done in 3 evenings!